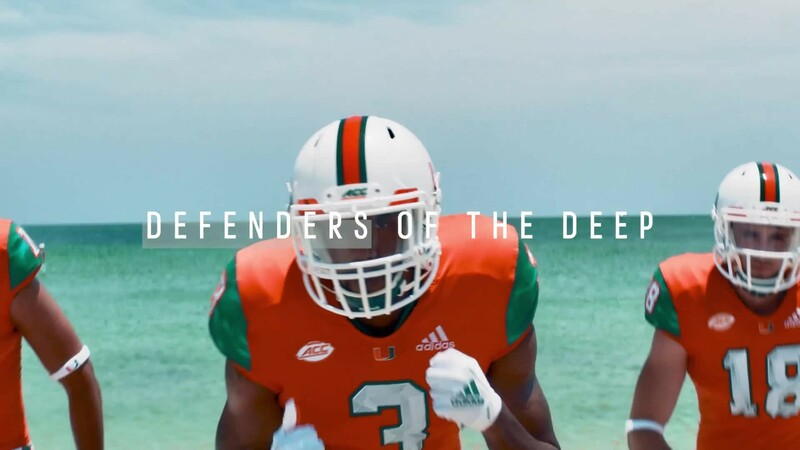 The University of Miami and adidas today revealed their new environmentally-conscious alternate uniforms for the 2018 season – the first-ever football uniforms featuring repurposed and upcycled materials created in partnership with Parley For The Oceans. The new uniforms will make their on-field debut for the Hurricanes’ season opener against Louisiana State University at the 2018 AdvoCare Classic at AT&T Stadium in Arlington, Texas on September 2. Highlighted by elements of the ocean from top to bottom, Miami’s new special edition adidas x Parley A1 football uniform is composed of over 70% regenerated ECONYL® yarn; a raw material transformed from fishing nets and other nylon waste intercepted in marine environments. As a part of their partnership, adidas x Parley rework these various marine plastic waste materials into technical fibers that create the material framework of a durable, yet breathable fabric that is optimal for adidas performance apparel. In addition to the new eco-innovative uniforms, players will also wear new adizero 7.0 or FREAK x Parley cleats and gloves featuring recycled materials for the September 2 game. The adidas x Parley football cleats mark the first-ever styles of eco-conscious footwear to be debuted on-field for NCAA football competition. Creating a unique look for the Canes, the Miami x Parley A1 uniform features “The U’s” home jersey orange colorway that is accompanied by accents that are an ode to the cause to end plastic pollution of the oceans. The jersey sleeve caps and the stripes white pants feature a wave print that fuses Miami’s signature dark green with the EQT green colorway that adidas x Parley has become synonymous with. Subliminal tonal palm trees on the sides of the jersey pay homage to South Floridian landscapes and the environment that enriches the biodiverse local ecosystem. The literal thread tying the Miami jersey to Parley is continued in a green stitched pattern within the white block numbers. In addition to the use of repurposed and upcycled materials, Miami’s new Primeknit A1 football uniform redefines the compression silhouette and takes the innovation and design of football jerseys and pants to the next level, with an emphasis on full range of motion, fit, form and function. A new body-mapping jersey design features an all-new ribbed knit pattern on the chest and shoulder pads to produce a refined fit, while knit engineered mesh channels feature Climacool technology to provide enhanced breathability and cooling zones. The development of a new innovative chevron pattern on the chest of the jersey aligns with a player’s shoulder pads and generates increased durability for high-contact zones for protection and the inside of the jersey features silicon grip patterns on the shoulders to lock the pads in place. Delivering a clean, iconic look, Primeknit finishes inspired by the adidas UltraBOOST and NMD are incorporated into the collar, while sleeve cuff and hem for added comfort and a new infinity neckline eliminates distractions and allows for a full range of motion. The revolutionary Primeknit A1 football pants have been re-engineered with just two seams and bonded pockets for added comfort and a clean compression look and feel, along ribbed Primeknit on the knees for added durability. adidas is committed to increasing the use of eco-innovative materials such as Parley Ocean Plastic® and regenerated ECONYL® yarn in its products as a replacement for virgin plastic and a symbol and catalyst for longer-term change. All uniform accessories were designed with the yarn spun from recycled and repurposed materials, some of which are made from waste that was intercepted from beaches and coastal communities. Additionally, coaches and sideline personnel will also be decked out in Parley gear, including the newest iterations of the adidas UltraBOOST Parley, to emphasize the team and brand’s dedication to minimizing our environmental impact. Follow the conversation on Instagram and Twitter via @CanesFootball, @MiamiHurricanes and @adidasFballUS | #ItsAllAboutTheU | #adidasParley | #teamadidas and on Facebook at https://www.facebook.com/adidasfootballus. For more Parley adidas products visit www.adidas.com/us/TheU.